If you have a travel bucket list, taking an African photo safari should be at the top. But what makes a once-in-a-lifetime adventure like this even more special is being able to capture images while you’re there to memorialize your trip and make it last forever. On Great Escape Publishing African photo safari tours, we show you how to take amazing photographs—not just beautiful photographs but saleable photographs. 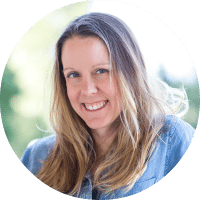 And then, we introduce you to a whole market of people who are willing to buy them… so soon after you return, you could experience the prestige of seeing them on the pages of a glossy magazine… on a billboard… or in an online stock agency. It’s an opportunity to see Africa in a way that you can’t as a typical tourist. And return home with a new skill and way to fund future trips there or anywhere you care to travel around the world. Below you’ll find some of the highlights from our 4 Must-See African Photo Safari Destinations in Tanzania, Botswana, Namibia and Kenya. These African safaris are so magical they’ll change you as a person… with their breath-taking landscapes, amazing people, unique culture, and history. You’ll return home with a real passion for this part of the world, having discovered it with a photographer’s eye—and a portfolio that’s bursting with amazing images, with the know-how to sell them. Nowhere in the world does the circle of life play out quite the way it does in Tanzania. Millions of wildebeest and zebras roam the expansive plains in the great migration. Gazelles, impalas, Tope antelope, leopards, cheetah, warthogs, elephants, giraffes, crocodiles, hippos, monkeys, hyenas, and lions—they’re all there, along with countless species of birds including the ever-watchful vultures. Opportunities for capturing wildlife in your photos are abundant. 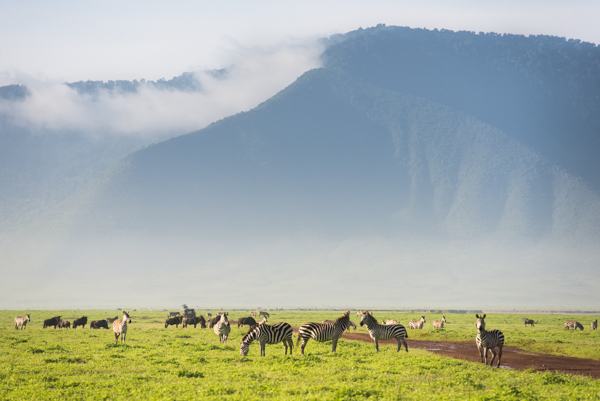 There are some things that are not to be missed like the three-million-year-old Ngorongoro Crater, sunsets on the Serengeti, the great migration, and the local tribal cultures. Ngorongoro Crater: One of the world’s largest cauldrons formed by a violent volcano eruption millions of years ago, the Ngorongoro Crater is commonly referred to as the “eighth wonder of the world.” It’s here you’ll see large herds of zebra, small prides of lions, and elephants bigger than our Jeeps. It’s also one of the best spots in Tanzania for sightings of the elusive rhino. This 10-mile wide volcano top with 2,000-feet-high walls is one of the most spectacular places imaginable. Central Serengeti: Nestled between the grassy plains of the south and the wooded hills of the north, the Central Serengeti is one of the richest ecosystems the national park has to offer. It’s common to see large herds of animals roaming the Serengeti: not just one elephant, but 50. Not just one zebra, but several hundred. And the wildebeest—they’re everywhere. You’ll likely see lions or zebras mating, elephants hanging out beneath trees, or a cheetah sprinting after its prey. Along the way you’ll meet with exotic birds, hyenas, giraffes, gazelles and impalas, too. 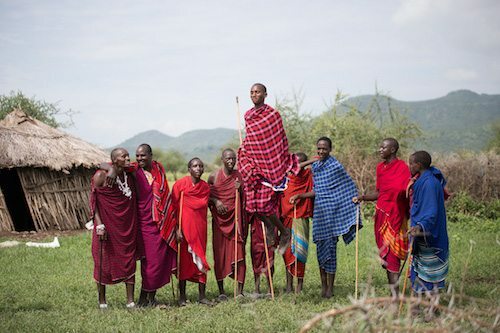 Cultural Interaction: Opportunities to meet and photograph THREE indigenous tribes of Tanzania. Our guides know the tribal chief of the most-iconic Maasai tribe—nomadic herders who welcome us into their homes, and share with us their schools, crafts, and customs… the hunter-gatherer Hadzabe tribe who will take us on a hunt and share with us how they prepare food, shelter, and bow and arrows for their kill … and the Datoga tribe, the blacksmiths who melt down bathroom faucets, pipes, and any scrap metal they can find to make arrow heads for the Hadzabe and jewelry they can trade for food. This is a true insider view. Other highlights include Tarangire National Park—known for its incredible concentration of elephants—and, Lake Eyasi, located on the floor of the Rift Valley. 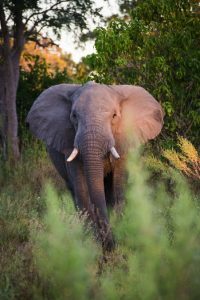 Botswana is considered the “holy grail” of safari experiences for many people… even safari guides from other African countries want to go there. It’s different because it’s covered in water. In many cases, you approach by boat. It has the largest concentration of African elephants. And you see things that are very different from what you’d see in Kenya, Tanzania, or Namibia. Horseback Safari at Royal Tree Lodge: There are no predators at the small game reserve at Royal Tree Lodge giving you the opportunity for a horseback safari. 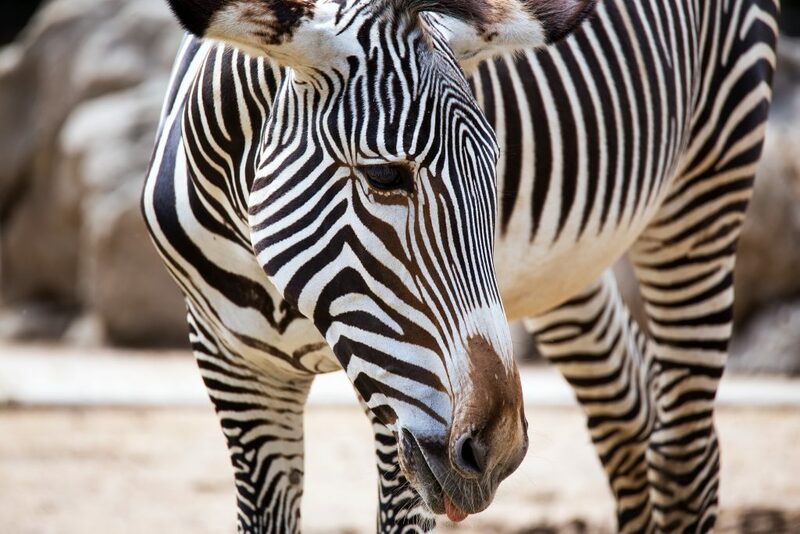 You’ll ride side-by-side among zebras and giraffes taking amazing close-up images of the animals in their natural surroundings. You’ll meet zebras with shadow stripes—unique to this area of Africa—and giraffes with wrinkles as they’ve grown old without the fear of predator attacks. Sanctuary Stanley’s Camp: A sanctuary on a private reserve located along the Okavango Delta, Stanley’s Camp provides the extremely rare opportunity to walk among ginormous African elephants. Here you’ll meet three orphaned elephants (Jabu, Thembi, and Morula) and have the chance to interact with them in their natural environment—a truly awe-inspiring experience. 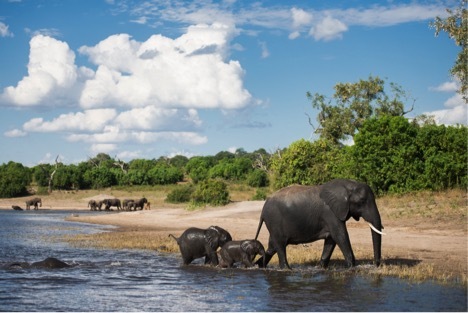 Chobe Elephant Camp: Head out with your guide for a boat safari along the Chobe River. You’ll likely spot elephants swimming and playing in the water… and glide past hippos and buffalo keeping an eye out for crocodiles wading in the water, searching for the perfect catch. 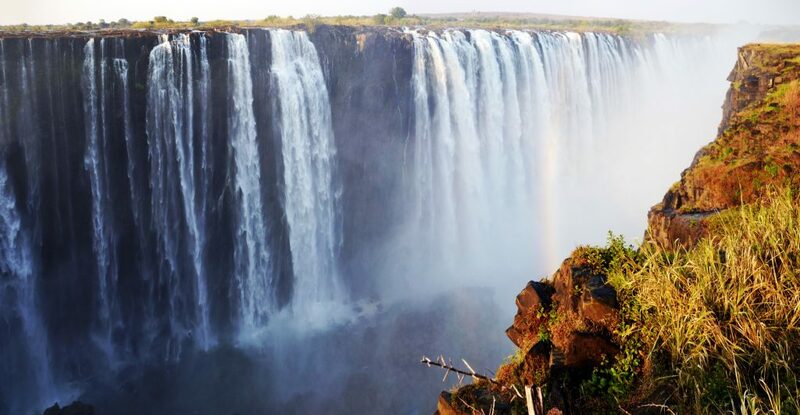 Other highlights include Chobe National Park—with its large herds of cape buffalo—and, the spectacular Victoria Falls. Namibia is like nothing you’ve ever seen before—with its red dunes rolling endlessly into the ocean. The Namib is the oldest desert in the world and a playground of deep red sand dunes, breathtaking landscapes, quiver trees that don’t exist anywhere else, and even a ghost town overrun with sand. Quiver Tree Forest and the Giant’s Playground: A Namibian icon, quiver trees are tall with thick round trunks topped by spiny branches once used by Bushmen as spines for hunting. A geological phenomenon, the Giant’s Playground has towering boulders stacked on top of another as if placed there by giants. Both the Quiver Tree Forest and the Giant’s Playground form eerie silhouettes during the blue hour and their surfaces take on a warm hue during the golden hour, creating unique opportunities to practice twilight photography. Lüderitz and Kolmanskop: Explore Lüderitz, admiring the colorful Jugendstil architecture and notable buildings such as the historic Goerke House and “Felsenkirche” (Church on the Rock). 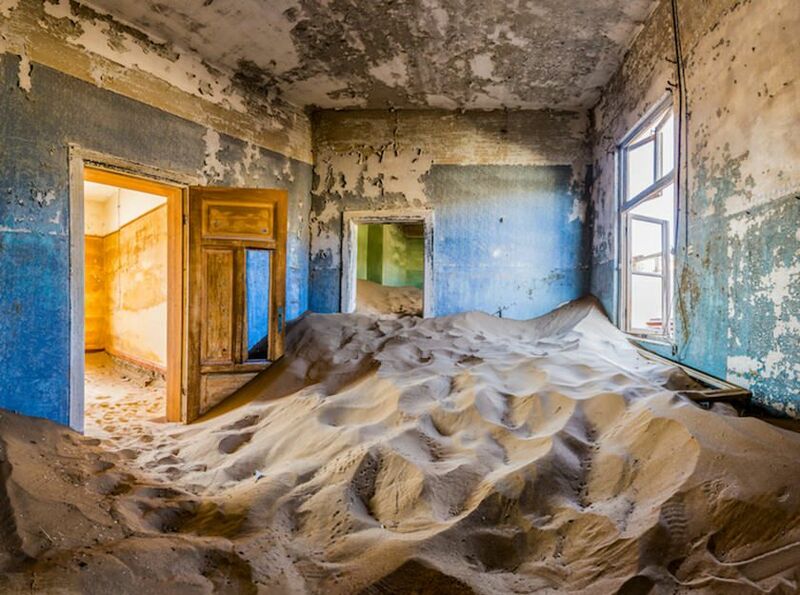 Discover the haunting elegance of Kolmanskop—Namibia’s iconic ghost town—whose streets and buildings are carpeted with waist-high sand dunes tumbling from one room to the next. Sossusvlei/Namib Desert: Since our lodge is inside the park, we can get to the dunes before everyone else—early enough to see the sun rise over some of the highest freestanding sand dunes in the world. 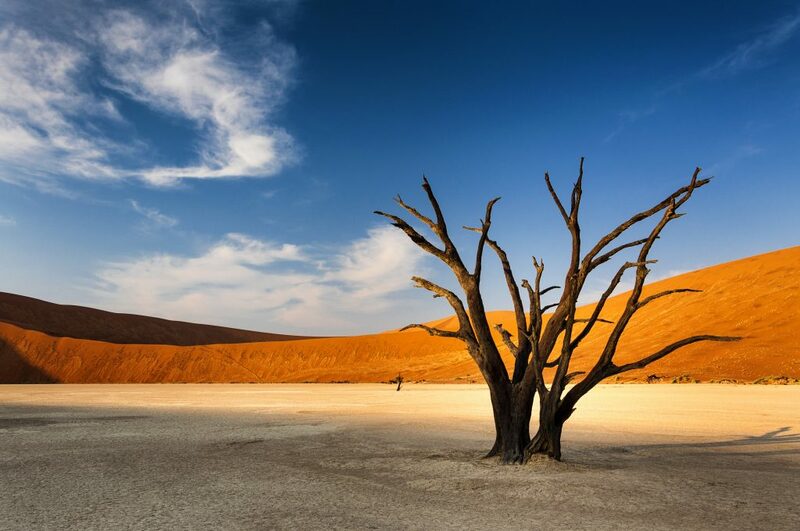 This area is also home to the Deadvlei—a dry, cracked desert pan with the still-standing remains of 800-year-old dead trees, framed by Big Daddy and other smaller dunes. Our guide will give us insights on the formation of the Namib Desert and its myriad of fascinating creatures and plants that have adapted to survive these harsh environs. 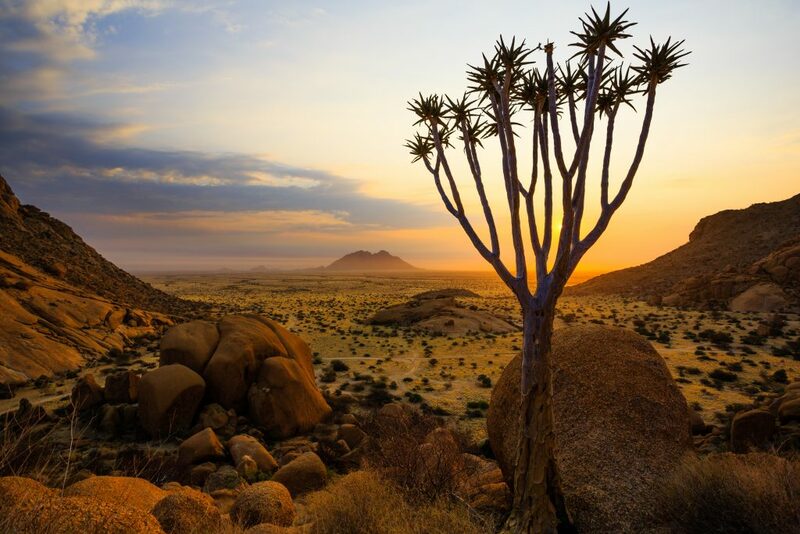 Other highlights include exploring the dunes of the Kalahari Desert and a visual feast in the Namib Naukluft National Park with its sienna-colored sand ridges and 260-million-year-old petrified trees. Kenya has always been a top safari destination with its dazzling array of wildlife. Its landscape encompasses savannah, lakelands, the dramatic Great Rift Valley and mountain highlands. Its rolling grasslands and scattered acacia woodland are home to the Big Five. Throngs of wildebeest thunder across the savannah during the Great Migration from July through October. The dry months from December through February provide for excellent predator sightings. Maasai Mara National Reserve: A preserved savannah wilderness in southwestern Kenya located along the Tanzanian border, the Maasai Mara National Reserve is home to lions, cheetahs, elephants, zebras, and hippos. Its grassy plains and rolling hills are crossed by the Mara and Talek rivers. 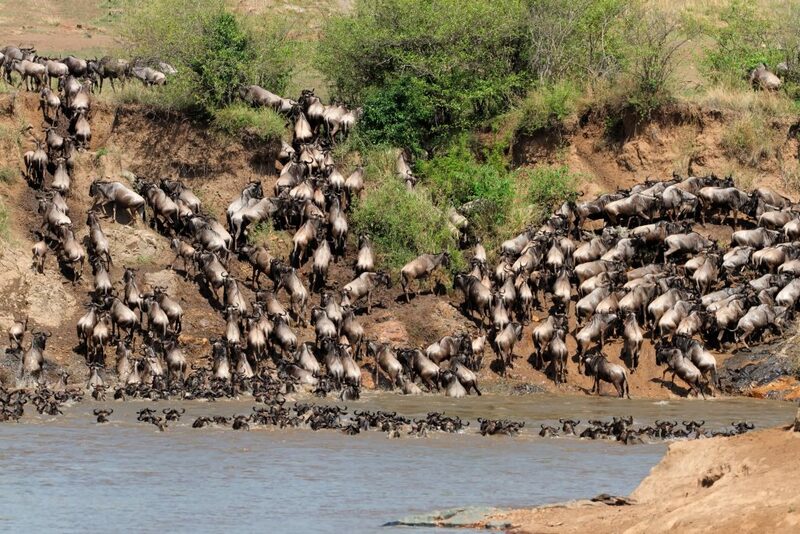 During the Great Migration, thousands of wildebeest traverse its plains. 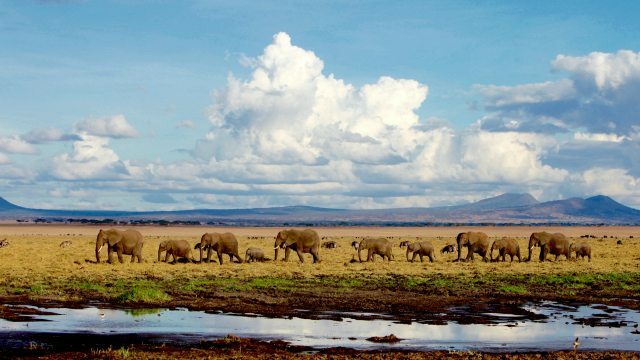 Amboseli National Reserve: Known for its large herds of elephants, Amboseli is an ideal place to capture close-up photos of these beautiful creatures as they roam. 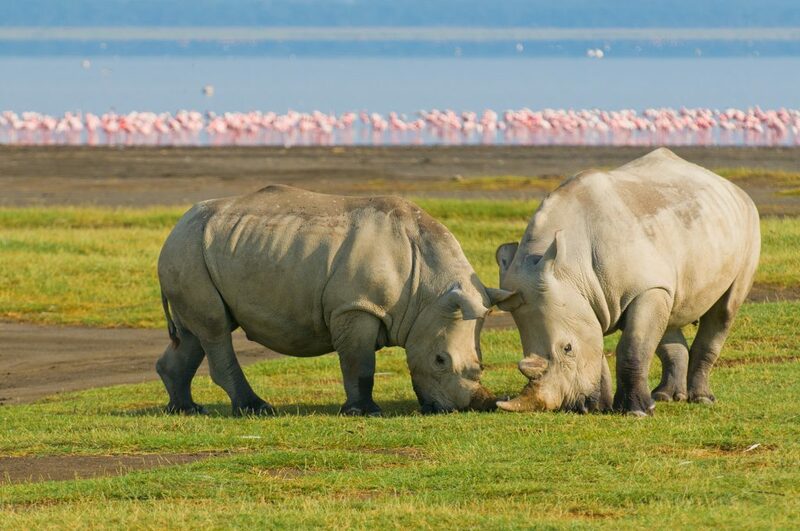 Big cats, giraffe, impala, eland, waterbuck, and gazelle inhabit the varied terrain which includes the dried-up bed of Lake Amboseli, wetlands with sulfur springs, savannah, and woodlands. With more than 600 species of birds, this is the place for your photos to take flight. Laikipia Plateau: Extending over more than 3,600 square miles of semi-arid plains, dramatic gorges and acacia-thicket-covered hills, the Laikipia plateau is the last refuge of Kenya’s African wild dogs. It’s also home to the country’s highest population of endangered species, including black rhinos and half of the world’s Grevy’s zebras. As the director of Great Escape Publishing, I’ve had the great privilege of leading and planning more than a dozen different photography tours across Africa in five different countries. Below are my own impressions of each destination—along with some other frequently-asked questions that come from people who are planning a trip to these places. 1. Is it safe to go on a safari in Africa? First and foremost, the number-one thing people worry about when they’re planning a trip or even considering a photography tour is if it’s safe to visit Africa. The truth is, you are probably more likely to get mugged or run into a problem visiting Baltimore or Washington DC or a city in California than you are in the national parks of these countries. And let’s face it, if you’re going on safari or taking a vacation to one of these places in Africa, then most likely you’re going to be staying in national parks, not mingling in the slums which is where most crime happens. In the cities, use your big-city smarts just like you would when you’re traveling anywhere. You don’t want to walk by yourself after dark, you won’t go into places you’re not supposed to, and you will keep your valuables close to you at all times and hidden from view. Bear in mind also that, to gain access to national parks, you have to pay a fee (sometimes a very hefty fee of $50 to $100). Any potential kidnapper or robber will also be charged that fee. He or she then has to drive 30 minutes or an hour to get to you, rob you, and then drive 30 minutes to an hour to get back to the gate at which time someone would have already reported him. Really, the more likely risk on your trip is twisting your ankle or hurting your back or knee getting in and out of the safari vehicles or while on a hike. Another more common risk is that the malaria medication will not sit properly with your heart medication or that it makes you dizzy or nauseous. 2. What is the best month to go on an African safari? Tanzania is probably the most famous for its February and August months. If you want to go and see the wildebeest crossing the Mara River—a famous spectacle often displayed on National Geographic—the time to go is August. In fact, that’s my least favorite time to go because everything is super-expensive and crowded. So for our photography workshops, I tend to avoid August. The second most popular time is during the great migration which happens in February—around the months of January, February, and March is an awesome time to go and a great way to see Tanzania. We’re not just talking thousands of animals… but hundreds of thousands of animals. It’s inspiring, gorgeous, and fun. Outside of these two times, I’d choose to go in November. November is shoulder season when I can get into luxurious camp accommodations at a fraction of what I’d pay if I were going in August or even February. I love the light for photography in November, and I love the clouds this time of year that can make your images really dramatic. I also love that there’s a lot of animals in November. You’ll certainly never see nearly as many animals as you would in a month like February or August, but I’ve always had great luck. Kenya is very similar to neighboring Tanzania. The same months that are good in Tanzania also work here–though Kenya is more populated by camps and hotels, so you have a bigger chance of overcrowding. That said, I do like certain parts of Kenya better than anything I’ve seen in a lot of the other areas in Africa. Samburu, for example, is one of my all-time favorite parks, so if Kenya is on your destination list, you can’t go wrong with a trip that includes the Maasai Mara and Samburu. Namibia I really like in July and also January. For photography, I prefer the months that bookend the rainy season, because you tend to get more of those dramatic clouds. But, if you plan to hike the sand dunes (highly recommended) you should also consider months that aren’t as hot. Botswana is popular year-round because it’s mostly covered in water. The tents camps here are very small, so they fill up quickly and are much more secluded than the other parts of Africa. The best time to go is May through September, during the dry season and winter, when there are more moderate temperatures and the Okavango is flooded. 3. How much does it cost to go on a safari? The cost to go on a safari in Africa depends greatly on the level of luxury that you want from your accommodation, the time of year that you’re visiting, and how many people are in your travel party. When you request a quote from an operator in Africa, you want to tell them what you want in each of these categories. Other factors can make your safari more expensive. For example, in Kenya and Botswana, it’s popular to fly between each national park, and destinations and flights cost a lot per person. Whereas, in Tanzania, it’s more common to get a driver that picks you up from the airport and drives you to all the national parks because a lot of them are within close proximity to each other. In my experience, Botswana is one of the most expensive safari destinations, followed by Kenya, Tanzania, and finally Namibia. If I had to pick a favorite, it would be Tanzania. Namibia is also very special for its red sand dunes, desert-adapted animals, and the petrified tree at Sossusvlei. But, for an all-around African safari experience, my absolute favorite is Tanzania for its incredibly large groups of animals and the absolutely gorgeous landscapes and backgrounds for photography. And I’m not gonna lie… I also appreciate their extra attention to luxury. I think it’s the best-value destination because you can get a lot more luxury for the same price you might pay in Botswana, South Africa or Kenya. Also somewhat unique to Tanzania are the closed safari vehicles. You’ll see them in other countries, of course, but they are primarily used and done best in Tanzania (also Namibia). For photography, the ability to stand up inside the vehicle and move to another seat while you’re in front of an animal is awesome. They also have air-conditioning and heat for those hot summers and cold winters. 4. 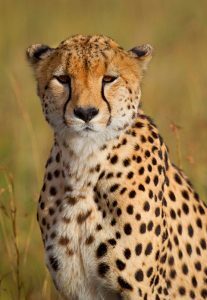 Why choose a GEP photo safari? Our photography tours are a little different than most… Besides guiding you in taking professional-quality photos, we also show you how and where to sell your images and video clips after you get home. Sometimes, when you take a safari with another company, what you’re paying for is just the photographer’s ability to put you in a good photogenic spot and get you at the right angle to photograph an animal. Not all photography workshops come with instruction on how to use your camera… how to get the best possible image… and how to make money from that image… but ours do. Our tours are meant to educate and encourage you to create amazing images… and then do something with these images… whether that’s to earn an income from them or help people understand another side of the world. We also have our roots in travel writing, so on every trip, we organize at Great Escape Publishing, we look for something off the beaten tourist path… things the average travel agent doesn’t know about or couldn’t arrange… like a visit to a local tribe with special permission to take photographs. These kinds of experiences set our trips apart.